The weather here has been dreadful and I’ve not gotten the finished photos taken of my next pattern that is currently with my tech editor, I’ve still got some time but I’d like to have them done and in the bag. Let’s hope that can happen this week. While waiting for a photoshoot to happen though I have been working away on some other charts and patterns and I’m hoping to get the next pattern in my schedule written up. This sample is knit already so it just really needs bringing together, another task for this week. 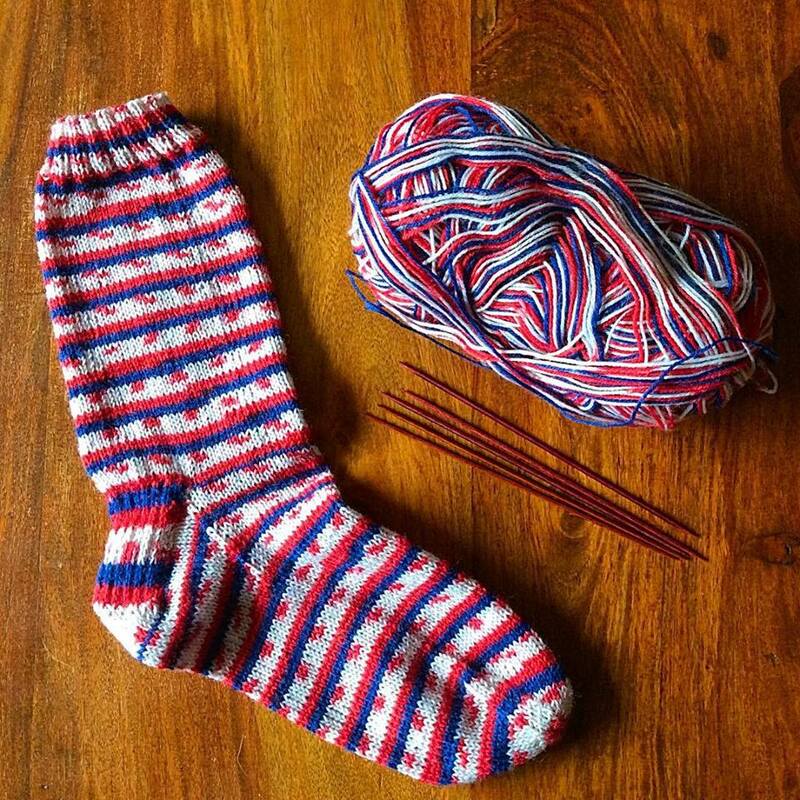 This entry was posted in Celtic Knits, Designs, Knitting, Year of projects and tagged How I Make my Socks. Bookmark the permalink. Red, white, and blue always had a fresh and modern look. These are softer versions of the colours. These are perfect spring/summer socks. Personally I rather like making socks out of these clever balls of wool! It looks great! it just goes to show that you can’t always judge a yarn before it’s knitted up. Thanks for sharing. I think they’re very bright and fun! Very summery and a little bit nautical! It is brilliant, I’m always quite amazed by these strange looking yarns!! I really like how your sock turned out and yes, you certainly couldn’t tell from the ball. Having no change in the stripe pattern from foot to leg is remarkable and I think I’ll have to give this pattern a try. Hope you get better weather soon. Ruth, if I understand correctly (me not being a sock knitter) you’ve had to do something intentional to get that even striped pattern? IOW, it’s not a natural pattern, necessarily, from knitting straight through with that yarn. I can understand your earlier not liking the yarn so much if that is the case. But you have made a really cute sock there. What fun they should be to wear. Yes I had to knit the heel and heel turn with yarn from the inside of the ball as I’d forgotten to take some off at the beginning for this part, doing it this way means when I go back to knitting the gusset and instep I am continuing on with the yarn from the front from where I was before I separated to do the heel parts if that makes sense, and so didn’t disturb the flow of the stripe pattern. I don’t know that I would have been motivated to knit with that yarn from looking at it either… But what a pleasant surprise! They look so neat! They are certainly the surprise socks I think of the year which is good because then the yarn is not wasted.